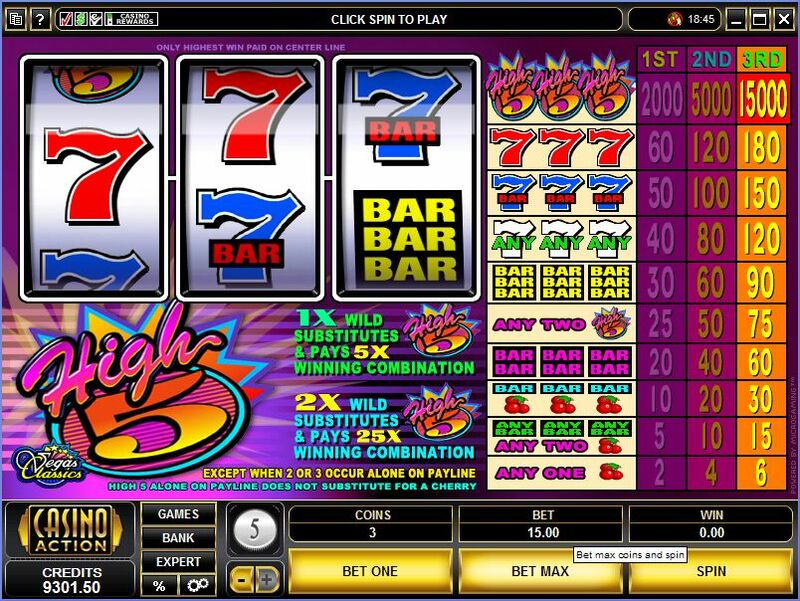 High 5 is one of those few impressive slot machines that despite being classics manage to integrate huge multipliers inside, using the wilds to deliver them. Designed by Microgaming, the biggest advantage I see is that list of features, not the design, which is rather average and inspired heavily by the classic pub slots. The main reason for playing this slot is mentioned in the features section, so keep reading. 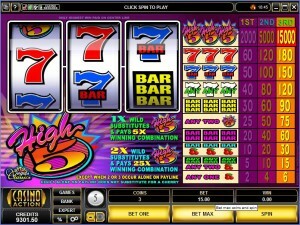 A classic 3 reel game, High 5 has a single payline. Despite the presence of only one line, it offers a wild symbol that can bring you multipliers of 5x to 25x, which is way higher than what the average feature of this type can achieve in other slots. The $75,000 top payout is one of the most impressive things about it. The game has a single major symbol, a wild that has a very large multiplier attached to it. The symbol used for it is the High 5 Logo. Seeing this Logo symbol on the reels tends to be very good news. If you get the wild Logo to substitute for another, being a participant in the formation of a new combo, you will get paid 5x more than usual, the multiplier brought by it being at that value. Get two of these Logos to act as wilds on the same line, forming a combo together with a third regular symbol, and you will notice that both of them apply a 5x multiplier, for a huge total of 25x. With three Logos, these wilds create their own combo, and you can take home up to 15,000 coins from them. A bet in this game will use between 1 and 3 coins, and I recommend you go after the maximum in this area. You can change their denomination if you want, make it as low as $0.25, or use it at the maximum of $5, but keeping the number of coins at 3 will insure that you get the most out of the top jackpot when you win it. The maximum bet will be up to $15. The slot’s biggest reward doesn’t take advantage of the multipliers of up to 25x of the wild, but it’s still a 15,000x multiple, which will put up to $75,000 in your pocket. The design is very busy, including a lot of information on the screen, but it’s not attractive. Themed around classic slots, it includes plenty of 7s, bar icons and cherries, the only one that’s out of the norm being the logo wild. There is quite a bit of purple in the design, which doesn’t make it look bad, but it’s not a plus in its favor either, at least not in the way they used it. Symbols: High 5 Logo (15,000 coins, wild), Red Seven (180 coins), Blue 7 Bar (150 coins), Three Yellow Bar (90 coins), Two Pink Bar (60 coins), One Blue Bar (30 coins) and Cherries (30 coins). I’ve enjoyed playing it, mostly because of the features and the level of excitement that is reached when 25x multipliers get involved, even though they don’t do it very often. Add a $75,000 top jackpot, and you got a couple of very good reasons to play this slot. High 5 can be found at any Microgaming casino, where you get a chance to play it for real money or in free mode.